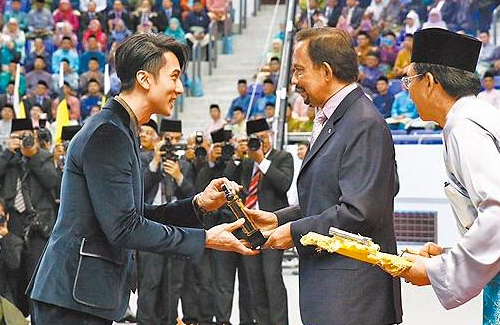 On September 1, the 10th National Youth Day in Brunei, actor Wu Chun (吳尊) received the Excellent Youth Award from the hands of His Majesty Sultan Hassanal Bolkiah, the Sultan and Yang Di-Pertuan of Brunei. Upon receiving the award, Wu Chun expressed his gratefulness for his family and friends, who have given him strength and love. He also expressed his love for his late mother, hoping that she feels proud and gratified. The Brunei-born actor and singer debuted in the industry as a member of the popular Taiwanese boy band Fahrenheit (飛輪海) in 2005. Due to his popularity and international celebrity status, Wu Chun became the ambassador to the Royal Brunei Airlines and the Brunei Tourism Board. The 35-year-old has been actively promoting tourism to the country. In Brunei, Wu Chun opened a gym, a restaurant, a fast food chain, and recently, a sandwich shop which he started with Vanness Wu (吳建豪) and his former Fahrenheit bandmate, Calvin Chen (辰亦儒). Wu Chun is involved in many charity events in Brunei, and recently organized an all-female marathon event, which brought in over 1,500 women to participate.